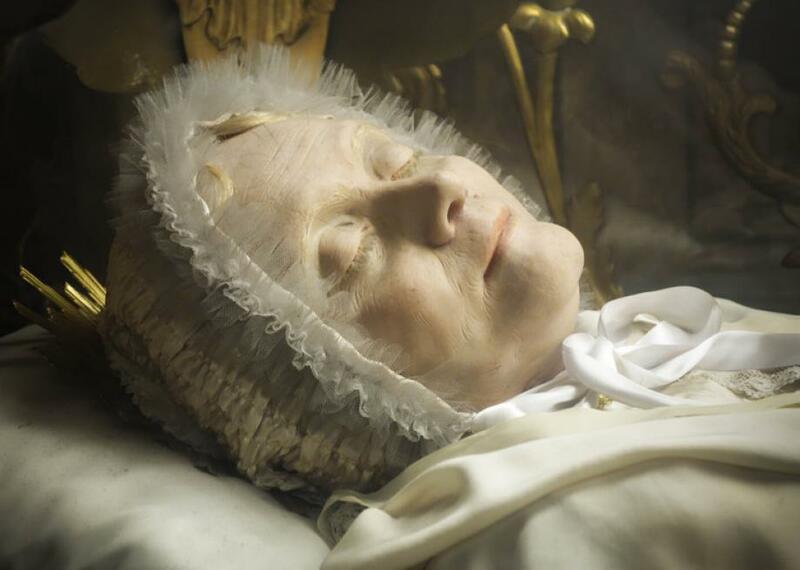 The incorrupt body of Blessed Anna Maria Taigi, wax portraiture over bone, San Crisogono, Rome. So it goes in the world of the incorrupt, a group of saints whose bodies supposedly won’t decompose. This particular corpse belonged to St. Paula Frassinetti, displayed at the Convent of St. Dorotea in Rome. In the popular imagination, the incorrupt are like sleeping beauties, but Paula, who’s been dead for 133 years, is shriveled and brown inside her crystal casket. This paradox is what makes the incorrupt fascinating. Most people think incorruptibility is permanent, but another incorrupt saint, Francesca Romana, disabuses that notion. She’s little more than a skeleton dressed in a nun’s habit. Francesca was deemed incorrupt a few months after her death in 1440. When her tomb was reopened two centuries later, she was nothing but bone. According to Heather Pringle, who investigated research conducted by a team of pathologists from the University of Pisa, opening a tomb can disrupt the microclimates that lead to spontaneous preservation, so even the body of a saint can decompose after it’s discovered. Incorruptibility also isn’t binary, something you either are or aren’t. It can affect just one body part, lending extra significance to a heart, tongue, or hand. There are shades and degrees within the ranks of the incorrupt that make their numbers impossible to tally. The best account comes from Joan Carroll Cruz, a housewife who took it upon herself to research and count every incorrupt saint. Though secular researchers find her too credulous, her book published in 1977, The Incorruptibles, remains one of the most complete lists available. Adding to the confusion around incorrupt saints are the ones who seem perfect but in fact are too good to be true. St. Victoria, a fragmented skeleton, was hauled out of the Roman catacombs at the mere suggestion she might be a martyr. In her lifetime, she would not recognize her name, story, even post-postmortem outfit changes: Those were pieced together or invented entirely by the church. On the opposite bank of the Tiber, the incorrupt body of Blessed Anna Maria Taigi rests in the church of San Crisogono. From afar she looks ideally incorrupt, but visitors who get close can see that the wrinkles in her face are formed in wax. A few dozen black hairs reach out from her blonde curls, signaling something more macabre underneath. She, too, is a skeleton. It’s tempting to see these lapses in realism and historical provenance and find satisfaction in that detective work. But the preservation of the incorrupt is often meant to be noticed. The sacristan, an officer in charge of overseeing Anna Maria’s sacred relics (what he sweetly called her “little old lady things”) explained that the wax on her isn’t designed to trick people. It’s to preserve an honest impression of her the moment she was discovered in her grave. This article originally appeared on Atlas Obscura in a modified form.